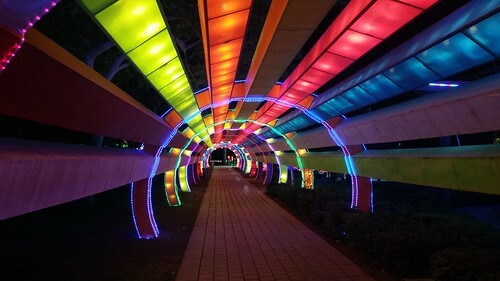 While walking beneath many decorated lighting attractions at Dubai’s Garden Glow, this colorfully amazing arc of light made me feel that what if I could just extend up till the horizon, so that I could walk under it for as long as I want to. Well, that didn’t happened despite my attempt of staying under it for more than a minute. Jia and Uzair walked ahead of me, so I had to catch them up. A world of color! Thanks for visiting my blog!